Tonight we are going to review a quite rare wine blend, as it is made of cabernet sauvignon and feteasca neagra grape varieties, where the first one forms the main body and structure, while the last one is the key of the whole blend, as it is meant to add those velvety-leathery notes to the final blend, which are so much sought after by the consumer. 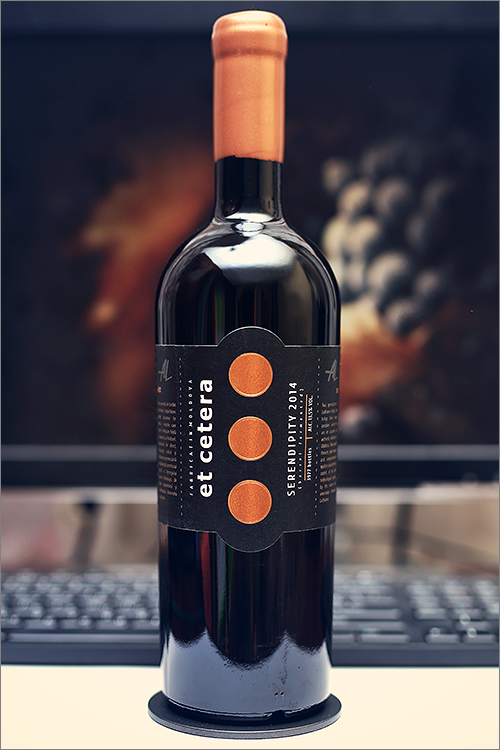 The wine we’ve selected for the review tonight is Serendipity 2014 from Et Cetera, which is a wine from the flagship line of Et Cetera premium wines. It has been aged for 18 months in new oak barrels and is produced in a quite limited edition of only 3977 bottles, but enough theory, let’s get straight to the tasting! Noble and quite transparent garnet color, with bright ruby hues towards the rim of the glass. The nose is strong, filled mostly with red fruit flavours: redcurrant, cranberry, sour cherry, red plum, blueberry, wolfberry, red mulberry, marionberry, rose hips and dried cranberry. An instant later the nose is filled with savory notes of leather, nutmeg, red pepper, paprika, cherry tomato, carpaccio, pepperoni, horsesadle, barnyard and some nuanced bloody-irony hints of sun-dried veal meat. The wine is dry, with high alcohol level, high acidity and smooth tannin. It feels lean, opulent and smooth, with a quite seedy accent. This is a very light, supple and crisp wine, as it tastes round and maybe just a bit too tart. The wine has a fair overall balance, with a very fine tannic grip and just a bit to much sharpness towards the end, as a result the wine feels young, angular and lacking some complexity. It has a medium finish and an balanced, tart and seedy aftertaste. This is definitely a great Wine of Moldova and the overall rating says the same, with 90.8 points scored it is right there, among the best wines we’ve tasted so far. Please click on the chart icon on the left in order to get to the wine rating page, where you can find all the wines we’ve tasted to date. Conclusion: this is a wine that is too young to drink now, a bit off balance, as its tartness and angularity has yet to round up and assemble some kind of harmony. We recommend a couple more years of bottle ageing, so that it will have enough time to get closer to its prime form. Despite its youthfulness, the wine has a fine and smooth tannic grip on the palate and a quite light, but rich palate. We would recommend to pair this wine with meaty dishes rich in bloody-umami flavours, like for example a medium-rare filet mignon with garlic and butter or a rare filet mignon with red wine reduction sauce, just remember to keep the filet mignon steak rare, so that it will counter-balance all the angularity in the wine and will enrich its texture. Cheers!